Really old (1908-1913) Sears houses are rare finds in Chicago and its suburbs. Part of the reason is that Sears simply didn't sell as many kit houses in that time period, as the Modern Homes business was still getting off the ground. I think another reason is that houses built from 1908-1913 in the older suburbs tended to be located in areas that were part of of suburban downtown redevelopment efforts and were consequently razed. I've found pre-1913 Sears houses in places like the Norwood Park neighborhood of Chicago, Des Plaines, Woodstock, and now, Itasca. 516 N. Arlington Heights Road, Itasca. Sears Modern Home No. 111 from the 1908 Modern Homes catalog. In the old days, the Sears homes had model numbers rather than names. Scan courtesy of Sears Archives. Sears Modern Home No. 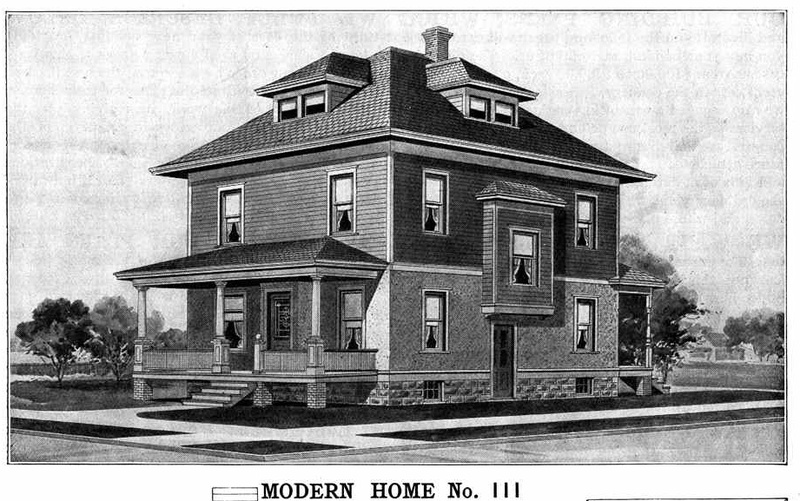 111 was offered in the first Sears Modern Homes catalog (1908). In later years Modern Home No. 111 was renamed the Chelsea. Sears sold this model all the way until 1924. The porch on this No. 111 is not the original one. It was removed at some point and then re-added years later. If you are looking carefully, you might have noticed that the front door is on the wrong side, as compared to the catalog illustration. What's strange is that the standard floor plan for the No. 111 also did not match the catalog illustration! 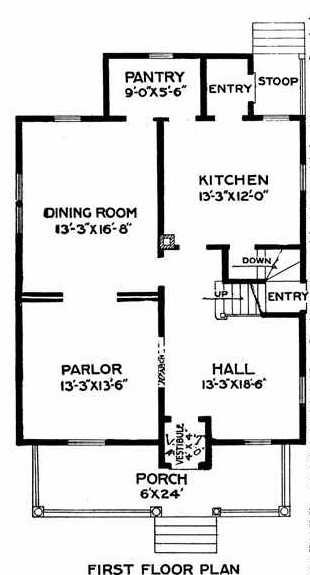 The floor plan shows that the front door should lead into the reception hall on the side of the house with the stairway (the house in Itasca matches this plan). The catalog illustration has the front door leading into the parlor on the side of the house opposite the stairway. Sloppy editing by someone at Sears. Scan courtesy of Sears Archives. The original homeowners were Frank C. and Clara Schumacher. They were married in 1912 and, according to their son, Helmuth, they purchased the No. 111 in 1913. Although the house sits on a large lot today and looks like it might once have been a farmhouse, Frank was actually a bookkeeper. Arlington Heights Road was called Division Street at that time. The architect of Modern Home No. 111 was Alfred L. Flegel (thanks to Sears House Seeker for that information! ).